Looking outside now I’m thinking I should have probably re-worked this title. The season have shifted and fall is definitely here. The wind carries a different kind of chill and mornings require an increase in cozy factor. I’m totally ready for it. We’ve moved into our little apartment in the city, and even though we are happy to be here – it is a big change from anywhere we’ve lived together in the past. We’ve been so busy running around these past few weeks, I feel like we’ve just been two people quickly crossing paths every now and then, but never stopping to really seeing each other. There has been so much on our minds and that never ending to-do is always floating between us. If you’ve ever moved with someone maybe you know what I mean. I guess it can all feel a little off. Slowly we are starting to make our own routines, creating a life that suits us both over here. I know this all takes time, but we’re getting there. We decided to take a break from it all this weekend and headed down to Vermont for a little camping getaway. We turned our car into a tent and called it camping 2.0. It felt like total luxury compared to our adventures this summer. We ate pasta, and peanut butter on bread and it was darn pretty cold, but we laughed anyways. It was simple. It was needed. The markets now are just bursting with all of summer’s bounty. 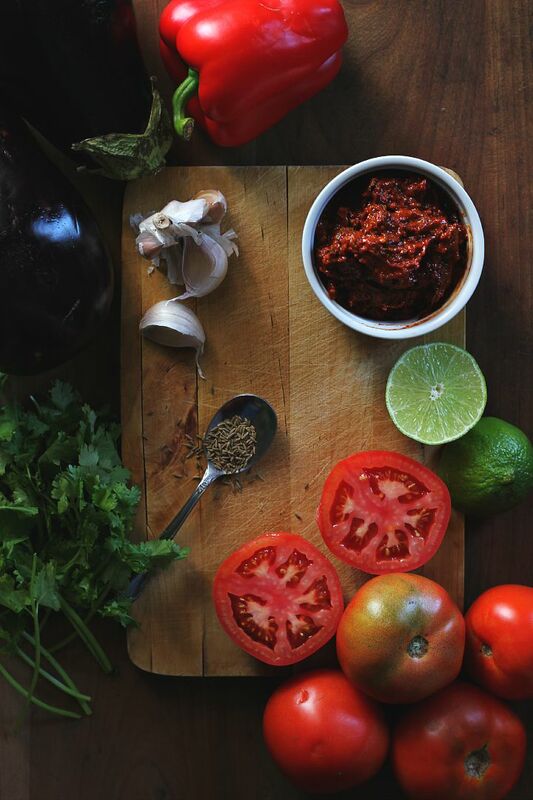 Big ripe tomatoes, zucchinis, peppers, eggplant and tons of vibrant greens. It’s the perfect season for slow stews and fresh soups. I took the idea of a traditional ratatouille, and added some of my favorite warm flavors. 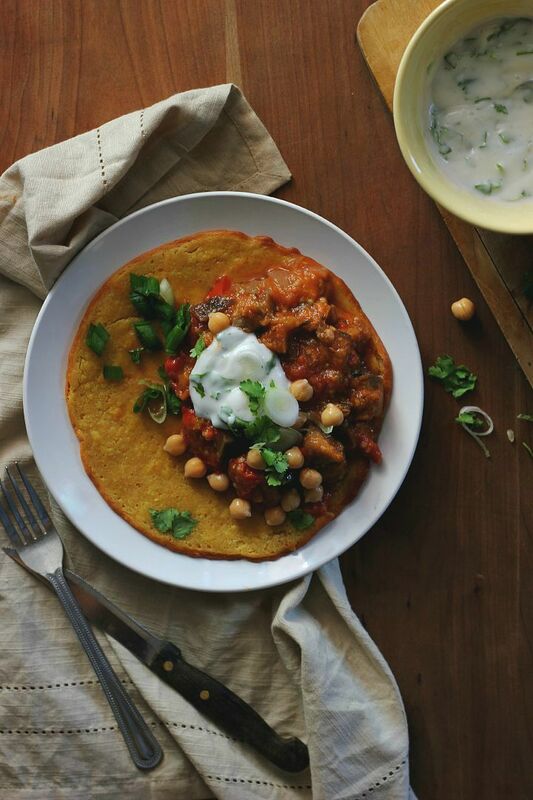 The mix of curried socca and fresh herby yogurt make this the perfect meal for these sunny fall days. 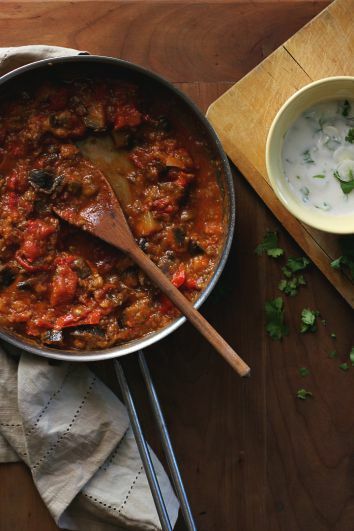 Ratatouille, harissa and yogurt can be prepared ahead of time. Socca best when served fresh. Vegan + Gluten Free. Serves 4. 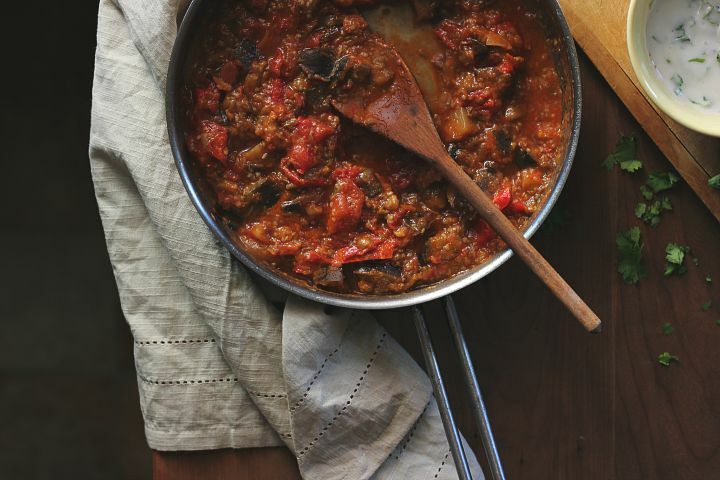 Heat olive oil in a large heavy bottomed pot over medium heat and add in chopped eggplant. You may need to do this in several steps depending on the size of your pot. Season with salt and stir so the eggplant is coated in oil, adding more olive oil (or a splash of water) if it seems a bit dry. 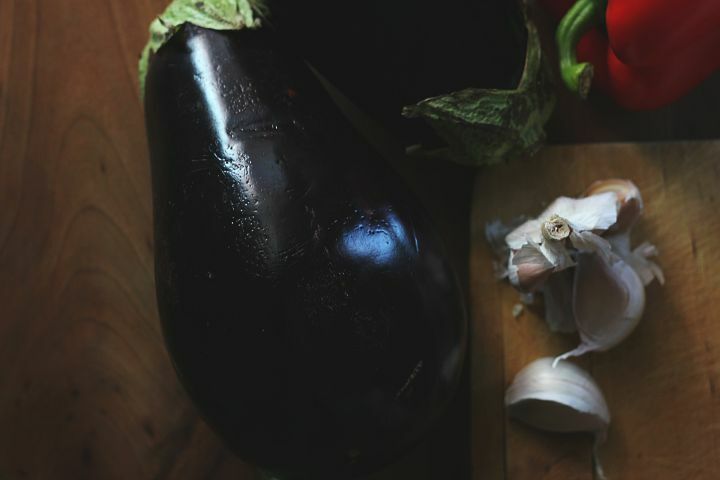 Cook on medium/high for 10 minutes, stirring often, until the eggplant starts to soften. Continue to cook for another minute or two, until just starting to brown, then remove from pot and place in a large bowl. Repeat if necessary until all the eggplant is cooked. Add a splash more oil to the pot, then add chopped pepper and onions. Cook on medium heat, stirring often, until soft, about 7 minutes. Be careful not to burn the onions, you want them tender. Add cooked onions and pepper to the eggplant and set aside. One last time add a touch of oil to the pot over low heat, then add the garlic, cilantro stems + cumin seeds. Slowly cook and toast over mild heat, until garlic is soft and seeds are fragrant, add a tablespoon or two of water here to make it really stew-like. Then add in the eggplant, peppers and onions and stir everything together until well coated. Add in the chopped tomatoes and harissa and cook everything down together until soft and stewy over low heat, about 15 minutes. Taste and season with salt + pepper, add a squeeze of lime before serving. Serve on top of crispy socca with herbed yogurt. Roast your red peppers. Place on a lined tray in a 350 F / 175 C oven and roast for 45-60 minutes during often until all sides are dark and charred and the pepper is really soft inside. Let cool completely then chop and remove the skin and seeds and set aside. Place ancho chilis in a bowl of hot water and let rest for half an hour until well softened. During this time toast the seeds together in a dry skillet until fragrant but not brown, about 3 minutes, stirring often. Remove from heat and set aside. Drain the chilis and carefully remove all the seeds, wear gloves here to be extra cautious as the seeds can sometimes be extremely hot. Give the chilis a rough chop and set aside. Add toasted seeds and garlic to the bowl of a small food processor or blender, pulse to break up and combine. Add the remaining ingredients and mix until smooth or desired consistency. I added a splash of water at the end just to help my little blender along and break up the larger pieces of chili. You could also add extra olive oil if you prefer. 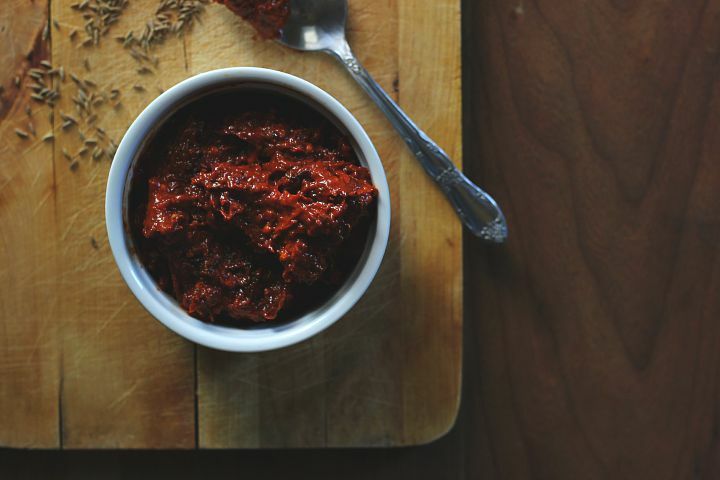 Harissa keeps in a sealed jar in the fridge for a two weeks. To be used on everything. In a large bowl whisk together flour, curry powder and salt. Add water and melted coconut oil and mix until well combined and smooth. Cover with a clean dry tea towel and let rest for at least an hour at room temperature. Preheat broiler. Warm 1 teaspoon of coconut oil in an oven proof, non stick cast iron skillet over medium heat. Poor in 1/4 of the batter and swirl to evenly distribute across the pan. Cook for 2 minutes or until edges are set. Transfer to the oven and broil for 5 minutes or until the top is golden brown. Remove from heat cool and loosed the edges with a spatula, then slide onto cooling rack while you repeat with the rest of the batter. Serve immediately or revive them later with a quick warm/toast in the oven. 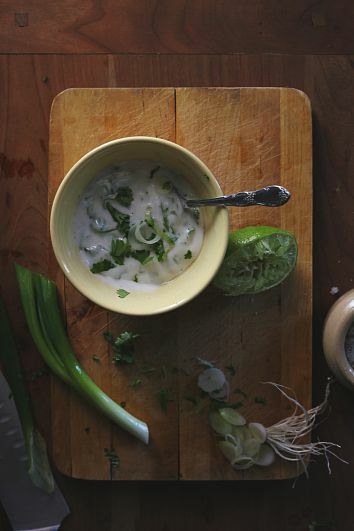 Mix together yogurt, herb and lime. 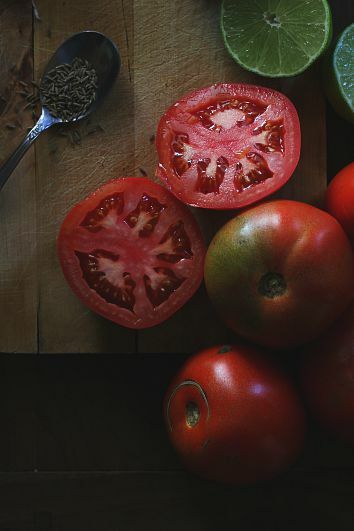 Taste and adjust seasoning to your liking: Finish with a drizzle of olive oil. This sounds so delicious and your photos are just dreamy; they totally capture the autumn/fall vibe at this time of year. I’m glad you guys are starting to settle in at home and I hope you enjoy everything that this season brings! 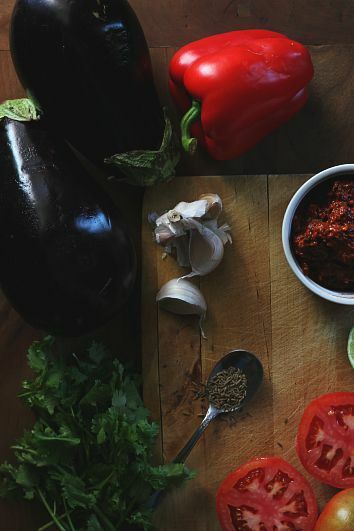 Ratatouille is one of my favourite late summer meals! But sadly I think you’re right about fall being here. Which comes with its own awesome seasonal food, but I just wish it could stay warmer for longer! Oh man, sounds like you guys are so busy!! Glad to hear you’re settling in somewhat though…and cooking really delicious meals!! This sounds awesome. happy to hear you are settling in! i’m sure it’s overwhelming, but i bet slow nights with a comfort dinner like this help. the assortment of flavors sounds deep and intriguing, and how lovely is that socca?! It’s always hard to settle in after a move, but I know you and Matt will get there!! It looks like you’re well on your way with this lovely ratatouille :) I love that you used coconut yogurt, that’s my favorite! Yes to coconut yogurt! I was missing out on all these delicious foods over in france, so my health food store budget has been a little high since moving home – but so worth it! We had a little dinner party last night and it is really starting to feel like our place now. Hope you are enjoying a sunny fall, Sarah – thanks for stopping by! New beginnings are always overwhelming, but they’re so exciting too. I hope you’re settling in and adjusting to your new life. What a beautiful recipe, perfect for transitioning from summer to fall! Just read about your blog trough faring well , and i’m so glad about it! It looks beautiful.Happy moving and happy new season for you too. Always Pie. I couldn’t agree more! I hope your adjustment phase continues moving along smoothly. It sounds like although you are at times overwhelmed, you are on top of things. Happy Thanksgiving! 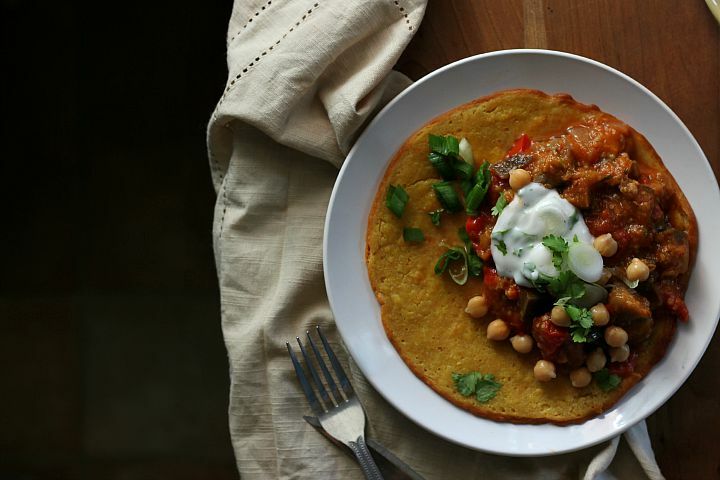 I LOVE socca, and this recipe looks divine!! 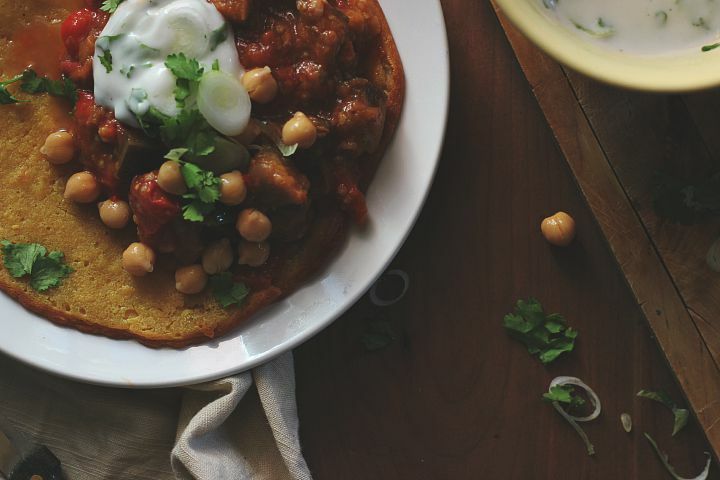 this is a great use for my chickpea flour! i would love to make this for meatless monday! 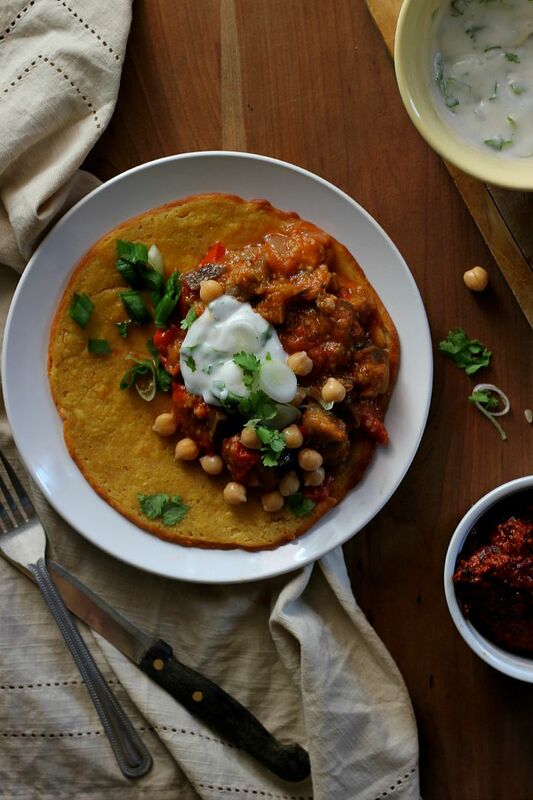 I have been wanting to make socca for a while now, love your chickpea filling. This looks so delicious! And comforting! I was wondering how much water you use for the socca. I don’t see it in the ingredient list. Beautiful photos! Thanks Emily! I’ve updated the recipe, it’s 1 + 1/2 cups of water. thank you so sweetly Jodi! it’s a pleasure to have discovered you. i’m excited to follow your beautiful endeavors.